Home Arts-Theater Brenda Brunson-Bey: Fabulous Is Her Business! Brenda Brunson-Bey: Fabulous Is Her Business! Brenda Brunson-Bey, fashion design artist extraordinaire, regularly turns heads in Brooklyn, a place where you can see any variety of fabulous on a given day. But Bey’s brand of fabulous is several steps beyond. A native of Georgia, she’s been in Brooklyn for decades, building a solid business with die-hard clients who take pride and pleasure in supporting her. Brunson-Bey describes her Tribal Truths Collection as “Africenfused”–centered in African fabrications and silhouettes (the circle, square and triangle) while incorporating European, Asian, Native and other influences. Her client is the culturally and socially conscious woman 18-80 and petite to plus-size. They can go anywhere and turn heads themselves; when your outfit displays innovative genius, you’re seen as a person of confidence and good taste. While growing up, Brunson-Bey took advantage of the home economics courses requiring students to have basic survival skills, but she already knew more than a bit about sewing. It was passed generously down the family tree and she feels both a creative impetus and spiritual responsibility to carry it on. Having been born with a greater number of choices, Brunson-Bey put her combined biology and chemistry degrees from Morris Brown College to use by teaching, working in a lab, etc. She later studied fashion buying, merchandising, advertising and communications at Fashion Institute of Technology in Manhattan. She later moved to New York for good as a buyer for Abraham & Strauss, designing on the side, but finding no pleasure in her day job. Browsing the shops nearby on her lunchbreak helped to lift her spirits. 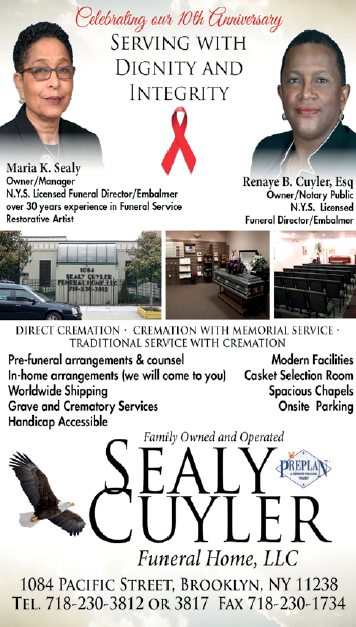 For 12 years, Brunson-Bey was a successful vendor at Brooklyn’s trailblazing 4W Circle of Art and Enterprise. 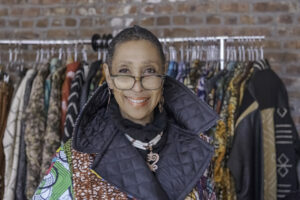 In 2003, she opened her Tribal Truths Collection boutique, remaining in business there for 15 years. She now has a showroom studio for clients to visit by appointment, an active Tribal Truths Collection page on Facebook and can also be reached on Instagram at: tribaltruthsfashion@yahoo.com and at 718-638-7624. Brunson-Bey is proud also of the brainchildren that are her civic and economic contributions. For 19 years, she’s co-produced the Fort Greene Juneteenth Arts Festival and she founded the Diaspora Art Collective, a monthly Brooklyn-based artists’ market nine years ago. The Tribal Truths Collection continues to thrive because not only are the beautiful pieces one-of a kind, they’re also the lasting kind – durable and too fashion-forward to ever go out of style. Her grandmother, a longtime client of Brunson-Bey’s, had passed away, and to know her granddaughter is wearing that coat touches and galvanizes the artist who made it.